WE SAIL FOR A JUST FUTURE FOR PALESTINE. The American media and politicians do not provide Americans with the basic facts about Gaza. Most Americans don’t know that most of Gaza is children or that Gazans can’t get sufficient food or medicine, etc. We tour the United States to speak to groups about the situation in Gaza and our activities. During these events we also ask for donations to fund the next boat(s) with the intention of breaking the blockade. We send one boat or a flotilla of boats on a periodic basis. The reason the Berlin wall fell was because a movement of people stood for freedom. 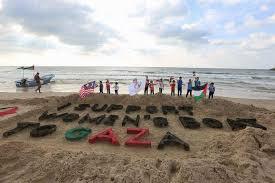 Boats to Gaza are part of such a movement. The Freedom Flotillas have been boarded and pirated by the Israeli Navy in international waters. US Boats to Gaza works to highlight how this illegal activity is committed to protect the oppression of human beings. Approximately 1 million children depend on us. It is our duty as human beings to stand for their rights. It is our duty as Americans to hold our government accountable for its complicity in these crimes. Commissioning short documentaries on life of Gaza with young Gaza journalists with the We Are Not Numbers group including an award winning documentary on Gaza fishers. 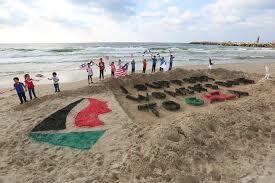 Beach in Gaza welcoming the Women’s boat. The boat was pirated by the Israeli Navy. We need to continue to shine a light on the violations of human rights for Gazans, especially its children. 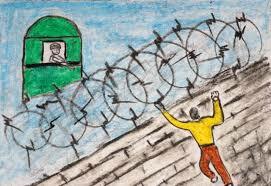 Inspiring hope and attention to human rights violations. Change The Future Of One Million Children’s Lives In Gaza.